A few years ago, I lost the power cable to my Dreamcast, but since EB was selling the console used for $15 at the time, I just bought another one. Today I finally got a new power cable for the other one, which happens to be the same thing as the PS2 power cable (who'd've thunk it). 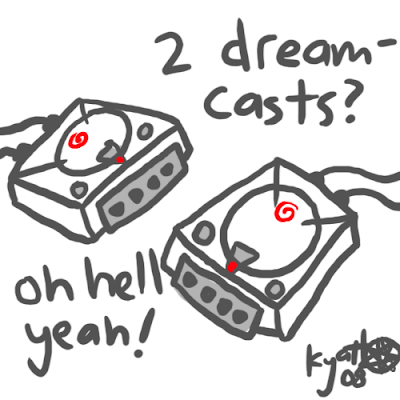 So now I have two fully operational Dreamcasts; I could play Space Channel 5 Parts 1 & 2 at the same time if I wanted!